Grace Trey, an eighteen-year-old singer from Homewood, Alabama, has been passionate about music for as long as she can remember. She's played with her dad in the worship service at their church ever since she was old enough, but Grace wants more. She wants the world to know her name. She wants to be a rock star. Her dad actually was a rock star years ago but left that lifestyle far behind, and it’s the last thing he wants for his daughter. This story was, in my opinion, a very accurate portrayal of someone who wants to leave their current situation in search of fame and fortune. 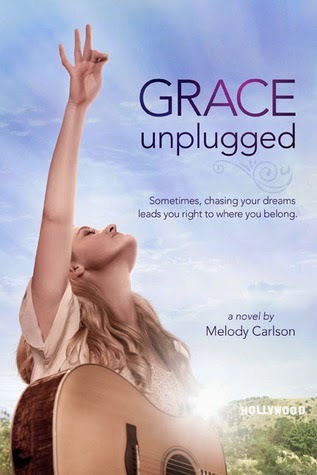 Grace, or Gracie, after engaging in several arguments with her parents about skipping college for a music career or even having a music career at all, runs away from home to California. She's contacted Sapphire Music, and they're very interested in her. It isn't long before she's recorded her dad's hit from all those years ago and made quite a name for herself, but fame isn't always what it seems to be. Within months of her rise to celebrity status, Gracie has turned to heavy drinking to deal with the stress of her song-writing, or lack thereof. Gracie's always had a problem with writing, but it's never really been much of a problem until Sapphire Music required her to write a follow-up single. Between the pressure of writing and her new habit of drinking, Gracie's life is falling apart at the seams; however, after a visit to a friend's house where she is very reminded of her own family back in Alabama and the faith in God they all shared, Gracie slowly begins to get her life back together. But when she's offered a chance to open for her favorite singer, Renae Taylor, Gracie has to ask herself – is this opportunity worth the risk of forgetting who she is and how she was raised? I really enjoyed this book. It had good pacing and believable characters. Even though Gracie and her dad both made some decisions and did some things I didn't agree with, that made them real and really added to the story. I could definitely relate to Gracie with her love of music and desire for a music career, and she was a very likable character. This is a great book for young teens as there is no inappropriate language or content, and I'm excited to see the movie that came out last year. I highly recommend this book to anyone who enjoys a light, quick read with a good message. I haven't seen this one before. It sounds like an interesting story and I am glad the pacing is good. :) Thanks for sharing! This sounds like a good one and I am so glad to hear you enjoyed it. Sounds like a really great coming of age story. Wonderful review as always! This one does sound like it would be an enjoyable read. I'm glad that the characters and their situations came off as believable as well. Always makes the story that much more fun to read! Definitely sounds like a book about coming of age and finding one's path.